Intel, Google, and several hardware partners held a press event in San Francisco on Tuesday to announce a fresh batch of devices based on Chrome OS, the launch of which Intel said made it "the No. 1 microprocessor in Chrome OS systems." In all, Chipzilla and pals demoed ten new devices that will be soon be released in the US, including not just laptop-like Chromebooks but also a desktop and an all-in-one design. The first big push will be a new wave of Chromebooks powered by Intel's ultra-low-voltage Celeron "Bay Trail-M" system-on-chip (SoC), including new models from Acer, Asus, Lenovo, and Toshiba. The two new models from Lenovo will mark the Chinese firm's first attempt to crack the consumer Chromebook market, having previously focused on education. One will be a traditional notebook, a company representative said, while the other will offer a touchscreen and an optional "stand mode." Asus plans to release new Chromebook models with 11.3-inch and 13.3-inch screens, and Acer and Toshiba will each upgrade their existing offerings to use the Bay Trail-M SoC. Exact specs for the new devices weren't given, but Intel says all of the Celeron-powered models will ship with Intel 802.11ac Wi-Fi networking for the first time, and the new processors will mean they will be fanless and should be able to deliver up to 11 hours of battery life. Pricing was not announced, either, but this new batch of power-sipping Chromebooks is expected to be priced competitive to earlier models – including ARM-based ones from the likes of HP and Samsung – which have retailed for between $200 and $500 in the US. They'll also be competing with higher-performance models based on Chipzilla's new fourth-generation Core i3 processors. Described by Intel as "a new class of Chromebook," the devices will be available initially from Acer and Dell, priced as low as $349 – so the Celeron versions will likely be even more affordable. And Intel doesn't plan to stop there. 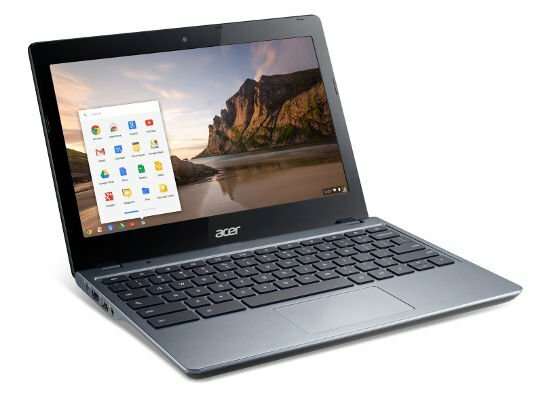 The chipmaker also used Tuesday's press event to show off its reference Chromebook design for education, which it plans to offer to "a variety of customers" as a starting point for their own education-oriented Chrome OS devices. In all, Intel said it plans to have 20 different Chrome OS devices based on its chips in the market by the end of the year. In addition to the aforementioned Chromebooks, that will include US availability of the all-in-one LG Chromebase for the first time, plus the launch of a new, desktop Chromebox device from HP.